Welcome to Piano Lessons in Parramatta, providing inspirational piano lessons for kids and adults. People of all ages and skill levels can learn to play the piano with confidence, read music, understand music theory, and grow your passion and appreciation of music! I figure you’re here because you are looking for a great private piano teacher in Parramatta! Well, you’ve certainly come to the right place! If you’re anything like me, you know that the choice of a good piano teacher is very important. I’m sure you are keen to find a piano tutor who can mentor your child in music, and lay the foundations for a great love of music for their whole life. You want a piano teacher who has a proven track record of excellence in working with children and who you can trust. The choice of a good music teacher for kids is so crucial, because the right person can make all the difference in how your child develops as a musician and as a person of good character. Then you want to make sure that the music you learn and the pace you progress works for your music preferences, your lifestyle, and your time commitments. You want to find a one-on-one piano teacher you can relate to and enjoy learning with. Someone you are confident will inspire you in your passion for music and expertly mentor you in achieving your goals as you learn to play piano. You are looking for the best piano teacher for you! My name is Elizabeth Myers. I have always enjoyed music, and I love teaching piano. I run an independent piano studio in Parramatta, where I aim to inspire another generation of young musicians. I achieved my Associate of Music Diploma (AMEB) in piano and completed my Bachelor of Music Education at the Sydney Conservatorium of Music. I am an accredited teacher with the Music Teachers’ Association of NSW. I have been teaching piano to kids and adults for over 25 years now, which is something I am passionate about. Providing quality private piano lessons and excellent music education is very important to me. My students love their music and many continue to enjoy playing piano throughout their life because of their time learning piano in my studio. 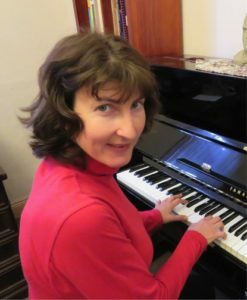 I have a wide variety of students, from beginners through to advanced piano students. I can teach piano lessons for 7 year old children, right through to 97! Piano skills and great technique are important when learning how to play an instrument and are taught right from those crucial early piano lessons. You can learn classical piano music and popular piano songs, piano chords and basic improvisation – there’s something for everyone! Theory lessons and musicianship are taught as a strong foundation for all music skills. I am passionate about making music theory interesting! We know that daily piano practice grows excellence in music. Piano students have opportunities to perform in piano concerts throughout the year. I prepare students for AMEB Piano exams and AMEB Piano For Leisure exams at all levels. Students wishing to complete their AMEB exams are well equipped and prepared, both for piano exams and for theory and musicianship exams. HSC Music is supported with tutoring in performance and aural skills, providing help with your assessment tasks, and HSC music exam preparation during Year 11 and Year 12 music studies. We always look for ways to make learning piano fun, and the music journey enjoyable. We know that playing piano is a skill for life, and growing a person’s love and enjoyment of music is vital for anyone taking piano lessons. My piano studio is situated in Parramatta, Sydney. Students travel from Parramatta, North Parramatta, Oatlands, Carlingford, North Rocks, Baulkham Hills, Westmead, Dundas, Ermington, Granville, and Western Sydney to learn piano with me. I’d love to teach you how to play piano too! So if you’re wondering where to learn piano in Sydney, your search is over! Call me today, and let’s get started! 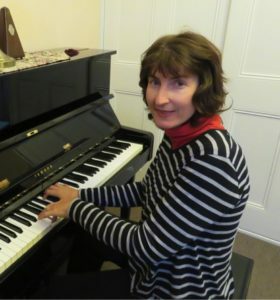 “Both my children have been learning piano from Elizabeth for more than 7 years. They adore her as she is a very kind, warm and understanding teacher, they said. Elizabeth always maintains a high standard of professional attitude, and communicates when it is necessary in relation to my children’s progress in learning. She will go the extra mile in supporting their areas of interest by researching and providing extra music sheets for the children to explore at home in their own time. Leading up to an exam she extends extra help in preparing resources they can do at home and is flexible if required. Carlingford, North Parramatta, Baulkham Hills, North Rocks, Oatlands, Dundas, Northmead, Westmead, Western Sydney. © 2017-2019 Piano Lessons In Parramatta - All rights reserved.